*This post is part of Ryan McNeill’s Blind Spots series. Francois Truffaut’s first film, The 400 Blows, tells the story of Antoine Doinel, a troubled teenage boy living in a small apartment in Paris with her mother and stepfather. Antoine’s mother is an adulterous woman who puts her career and romantic affairs ahead of her son – whom we learn she wanted to abort. His stepfather is only slightly more attentive but equally unloving. Antoine lives at home but feels far from it. His travails at school are even more troublesome. Antoine isn’t just misunderstood, but unfortunate as well. He gets caught with a pinup calendar being passed around by the rest of the class, and caught again while returning a stolen typewriter. The ending to this bleakly humorous tale of adolescence is a zoom in on a freeze frame of Antoine’s face as he turns away from the sea. He’s always wished to see the shore and, escaping from a penitentiary school, he finally finds the chance to smell freedom at bay. This single frame is, without exaggeration, the perfect ending – if there ever was one – and one of the greatest film endings of all time, if not the greatest. It’s a moment that fills one with raging emotions, captured romantically in the distant haze of our young anti-hero. It closes a chapter in Antoine’s life and opens the rest of it. It captures the feeling of being troubled, confused, free, captive, hopeful and helpless. It captures what it means to be a boy. Francois Truffaut is a favorite filmmaker of mine. The 400 Blows isn’t his only masterpiece. There is also Jules and Jim, The Wild Child and Day For Night. Then there is The Story of Adele H. and The Green Room. It’s a rich filmography that I’ve been familiar with and cherished and loved since the fateful day I first watched Jules and Jim. But Stolen Kisses had always eluded me; or rather, I had intentionally neglected it. Because how can any director follow up on a film like The 400 Blows? How can you build on that? This is to say that one’s first encounter with Stolen Kisses is bound to come with a lot of trepidation and with good reason. Although we can argue till dawn about whether it is ethical or unethical to view a film in light of another, instead of considering it as an entirely separate entity on its own merits, in this case, it is almost inevitable to look back and compare. Stolen Kisses begins as Antoine is being expelled indefinitely from the army after a period of service. Rejection is nothing new for the boy we knew, but something has changed since his adolescent years. Antoine is rejected, but not dejected. He appears to be ecstatic, in fact. He’s grown into being the odd one out. Where in his formative years, he would have appeared puzzled and rebelled against the role that society had deemed fit for him, his rebellion here is comically subversive. There are no signs of frustration at his lack of ability to transcend mere conformity. He shrugs off his imposed duty in the army and seems content to take up another job – really, any job – in its stead, so long as it allows him to fly under the radar without being bothered. 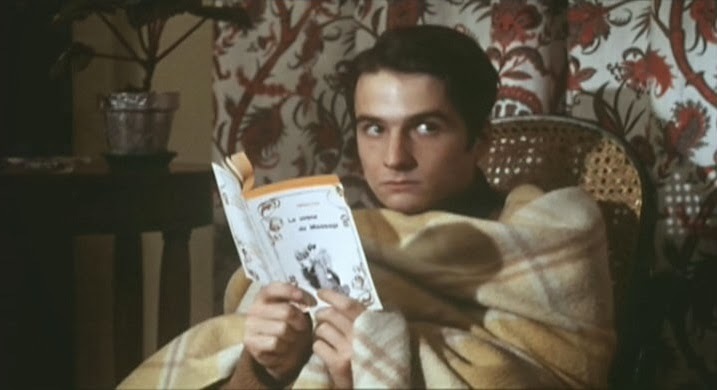 And here’s what’s really changed since The 400 Blows: Truffaut’s rendering of Doinel has changed as much and in the same direction as Antoine himself. If The 400 Blows, as Truffaut’s first film, seems precociously smart but swept up at once in youthful energy and agitation – and hence, mirroring the traits of its protagonist – Stolen Kisses has grown to become an adult who has learned to be nonchalant about his misfortunes – again, mirroring the older Antoine. If rejection by The Man in the youth correction centre of the first film forced Antoine into an escape, rejection from the army puts a smile on his face. Truffaut’s most important decision in directing the film is adopting Antoine’s attitude, shifting the tone of the story at times to a flat-out comedy. It’s a choice that feels slightly off-putting at first for the unassuming viewer, but the key to appreciating this film, to warming to its charms, is to view it as a standalone piece, not in comparison to its predecessor. Admittedly, Truffaut doesn’t particularly help his audience to do that, for he draws on several sequences from the earlier film for inspiration. Take, for example, the freakishly hilarious scene where Antoine is being told off by a prostitute. If it feels like déjà vu, it is because we really have seen it before, in a conversation where a correctional officer asks the young Antoine in Blows whether he has ever been with a woman. He responds by recounting a story about rejection by a Parisian prostitute. Truffaut invites this comparison, and creates a sense of continuity in the repetition of the story, but simultaneously keeps the audience aware that his keen observations have now found a cheeky flavor to them. What is beautiful is that Antoine (brilliantly re-played by Jean-Pierre Léaud), meek and with shoulders so hunched it makes us believe his figure has been reshaped by his adversities, transcends the comedy and avoids becoming a caricature. Stolen Kisses could have become a hilarious romp about the world’s worst detective – an unlikely occupation Antoine dedicates to with an unending capacity for clumsiness – and nothing more. Under Truffaut’s guidance, however, it is a tender re-examination of a character who has learned to look at the world differently; a man who at once seems wiser than everyone around him, as if he’s really above it all, but also still views the world with genuine childlike curiosity, allowing some of the film’s funniest moments to blossom. Truffaut’s gift for comedy hasn’t been appreciated enough in the study of his body of work, but it is one of most distinguishing features that really set him apart from most of his contemporary nouvelle vague comrades, and it is also what makes this film such a special treat. For while Stolen Kisses doesn’t quite reach the heights that its prequel did – I admit to watching it twice in the space of one week to formulate my thoughts and fully appreciate it – the truth is that very few films have ever done that. The juxtaposition is reductive and casts a shadow on Kisses that it can hardly escape. Removed from that daunting comparison, the latter film reveals itself as one of Truffaut’s most intelligent and structured works; probably his funniest, too. Just wanted to say thanks for writing a January post! I’d leave a longer comment, but I’ve never seen Stolen Kisses myself – it’s a Blind Spot for me too. I really like Stolen Kisses. I had marathoned all of Antoine Doinel movies in my French New Wave “phase” and this was actually my favourite. I found it adorable. I need to rewatch it though.